Our heavy duty, all rubber power cords are the connecting link between the generator and a transfer switch via a power inlet box. All rubber cord stays flexible even in subzero temperatures. 50 ft. cord, 4 conductor, 10-Gauge wire with L14-30 male + female ends. UL Listed. Generac's 7.5 kW PowerPact home standby generator with automatic transfer switch is the most affordable, automatic alternative to portable backup power. Significantly quieter than a portable generator, it protects the homes most essential circuits, like refrigerators, well pumps and select appliances, without having to manually set up during inclement weather, refuel, or run electrical cords. The Breather warmer is only for use in extreme cold weather applications where heavy icing occurs. For use on Generac Air Cooled units manufactured 2013 to present, not all Air cooled units. Also consider model 7101 Battery warmer and 7102 oil warmer cold weather accessories (compatible on both 50 or 60 hertz units). 50 ft. 30 amp 7500W Generator Cord Our heavy duty, all rubber power cords are the connecting link between the generator and a transfer switch via a power inlet box. All rubber cord stays flexible even in subzero temperatures. 50 ft. cord, 4 conductor, 10-Gauge wire with L14-30 male + female ends. UL Listed. 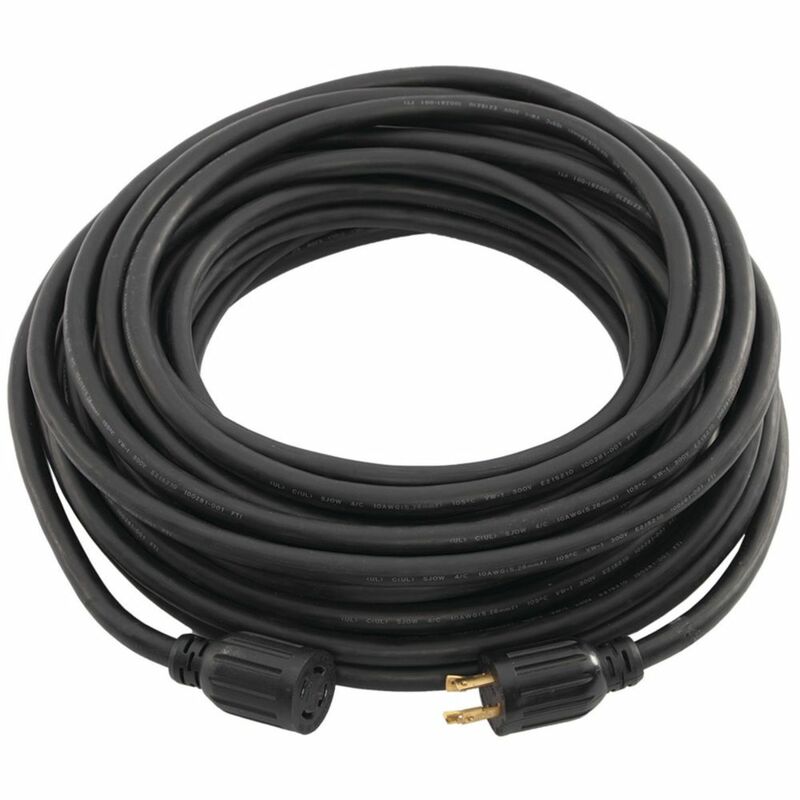 50 ft. 30 amp 7500W Generator Cord is rated 4.5 out of 5 by 13. Rated 5 out of 5 by Delta from This cable is very pliable and easy to handle without kinking and lies flat. This cable is very pliable and easy to handle without kinking and lies flat. Rated 5 out of 5 by Mike from Product was exactly as advertised, good quality as far as I can tell. Product was exactly as advertised, good quality as far as I can tell. Rated 5 out of 5 by TKN from Excellent quality High quality generator cord. Worked as designed during testing but no continuous operation data as this is for an emergency power generator. Have confidence it will perform as designed when it's needed. Rated 4 out of 5 by Brian from Economical Way to Tie into the Main Panel The cord is being used to connect the generator to the panel while keeping it a safe distance away from the house. You will need a qualified electrician to upgrade your panel if it is not configured or sized to accept a portable genrator. My only negative critique is that it looks like the cord I received was returned and repackaged since it was not in a factory sealed bag. It also took longer than expected to be delivered. Rated 5 out of 5 by GoHogs from Heavy duty cable Worked as advertised. Length is good for getting the generator and the carbon monoxide it produces safely away from the house. Good product. Rated 2 out of 5 by Derek from Product received not as described. Ordered this product specifically because of the molded on plugs as specified in the product description. Item received had the standard screwed together plugs.